"Accept the gift as if it were one you had chosen." I think of that quote as a reminder that although I didn't ask for the disabilities in my child, he is still an amazing gift, one that I would choose over and over again. Your jewelry is not only beautiful but so inspiring! I really enjoy your blog too, and have become a fan on facebook! I looked for a JP group on Facebook a couple of months ago, so I'm so glad you've started one. 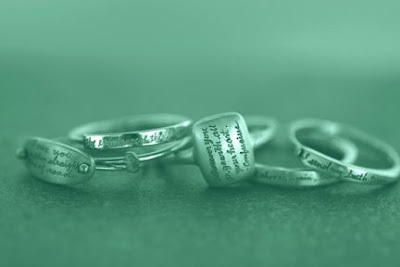 Two years ago, I ordered a custom ring (through Giving Tree Gallery on Cape Cod), and I wear it every day. Your work is so lovely (beautiful, in every way), and I'm very glad you do it.